We had an uncomfortable night at the anchorage (Ormos Panormos) on the NW coast of Astypalea (aka Astipalaia). Before going to bed we lifted the main anchor and re-laid it, after dropping the other anchor astern. It took about 7 tries to get the main anchor to re-set and, the boat still rocked around in the night because of the swell coming into the bay! On Wednesday morning we sailed around the west coast of Astypalea. At first we faced heavy seas and F5 winds on the nose so it was difficult getting out of the anchorage, but then we had flatter seas on the SW side. When we got the the south coast, the winds increased, gusting F8 at times but with flat seas we were able to make good progress under much reduced sail. On reaching Skala, the main harbour on Astypalea, we were able to anchor amongst a few other yachts there, and the shelter was good. We stayed two nights in Skala, visiting the hill-top town with its interesting fortress, and passing the time of day in the local cafes and tavernas. 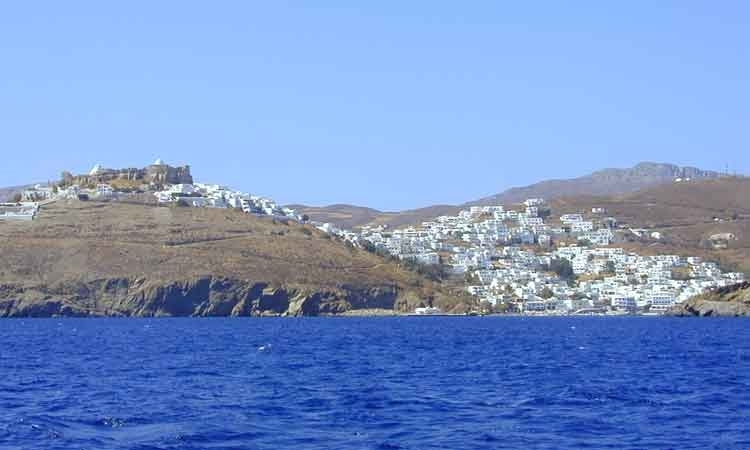 Astypalea has no package tourism and is a pleasant, relaxed place. The island is rather barren and we didn't see much fish so what the islanders live off is a guess. 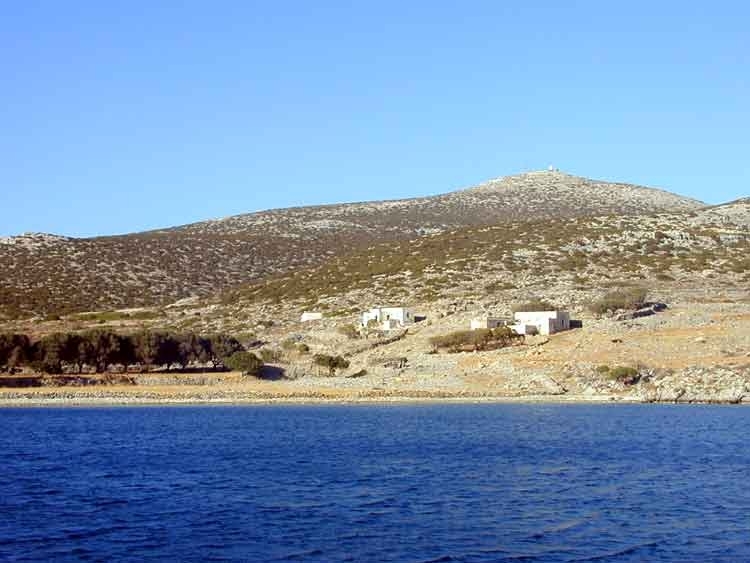 On Friday we sailed a short way along the south coast and anchored in a deserted bay, Ormos Agrilithi. The wind was still strong and the seas flat so we made good progress again. There were a few seemingly deserted houses and the inevitable goats but we didn't feel that isolated because on one side the hill had a mushroom-shaped radar dome on top of it and on the other a big cellphone mast. The latter was not much help as we could only get poor reception there for emailing. Despite the stronger winds the temperature has been creeping up again over the last few days and is now reaching over 30 degrees in the mid-afternoon. Yesterday we left Astypalea and had another good sail east to Kos island in F5 winds. We passed quite a few ships and some yachts but otherwise it was an uneventful trip, apart from the Aries self-steering playing up. We anchored just south of the harbour at Kamares, on the south of Kos island. It's a tourist resort but luckily we were far enough away to miss the Saturday night disco noise. Overnight the wind dropped completely and we woke up to almost calm conditions. On Wednesday we will be meeting Gavin on Kos so we decided to head a short distance south to Nisiros island in the meantime. We motored here in near calm conditions and we've moored up to the quay in a little fishing village called Palli. Nisiros is a volcanic island and rather interesting because apart from being relatively green and fertile, the island makes a lot of money out of quarrying pumice. We're told the crater is well worth a visit so that's on our itinerary for tomorrow.